Tlācatlahtocāyōtl Āltepēhuahcāyōtl Tlācatēpacholiztli Corea (TĀTC) ahnozo Corea Mictlāmpa (coreatlahtōlli: 조선 민주주의 인민 공화국, Chosŏn Minjujuŭi Inmin Konghwaguk), tlācatiyān īpan Asia. Ītēcuacān Piongyang ca. ³ Kim Yong Nam es el jefe de estado de facto. 4 Algunas agencias de ayuda y desarrollo estiman la población entre 18 y 20 millones. In tōcāitl Corea mopēuh īpan in huēyitlahtohcāyōtl Goryeo (Gorieó), ōquitepachoh cē huēyi tlālli īpan in Tlālyacatl Corea ītzalan in mācuīlpōhualxihuitl X īhuān mācuīlpōhualxihuitl XV. Momati īca inīn tōcāitl īpampa īpan in mācuīlpōhualxihuitl XIII in ihcuāac in italiapōchtēcatl Marco Polo ōāltepēitta inīn tlālli ihcuāc īācalpapanōliztli īpan China huēyātēntli, inīn ōcacta in matiliztli Europan īhuān Corea ītzalan. In tlahtōlli Gorieó ōmocuep īpan Corea in mihtoa ītechpa inīn tlālli. In Corea Mictlāmpa chānehqueh ōmotōcāitih mochi in tlālyacatl iuhqui 조선, Chosŏn; īhuān īntlācatiyān 북조선, Bukchosŏn, quihtōznequi Mictlāmpa Tlācatiyān (Chosŏn Mictlāmpa). 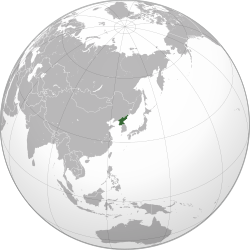 Corea Huitztlāmpa tlācah tōcāitih in Corea Mictlāmpa iuhqui Bukhan (북한, Han Mictlāmpa).